The challenge of modelling rarefied gas flow in complex geometries remains formidable despite the numerous scientific and industrial applications including mass spectrometry, low-pressure environments, vacuum pumps, micro-electro-mechanical systems, high-altitude vehicles, and porous media. Over the years, we have investigated the use of the Method of Moments as a potential approach to tackling the problem of modelling low-speed flow with moderate Knudsen numbers (Kn). In particular, our motivation has been to develop a capability to move from the Navier-Stokes-Fourier description of flows into the slip and early transition regime (Kn ~ 1) whilst retaining the efficiency of modern CFD codes combined with the ability to capture the essential physics of rarefied gases. Before embarking on this endeavour, we performed many benchmark studies with the Method of Moments and found that the regularised 26-moments (R26) was the best compromise between accuracy and efficiency. From the outset, we wanted to have an open-source approach and, after considering the various codes available, we decided to use Code_Saturne. This code is being developed by EDF (Électricité de France) and can be used for a wide range of problems. Of particular interest is its ability to perform very well in parallel, scaling well beyond 100,000 cores, and its moving-mesh facility for applications involving turbomachinery. The extension to the code was funded through an eCSE award (eCSE10-1) and we were able to retain the excellent scalability of the code. 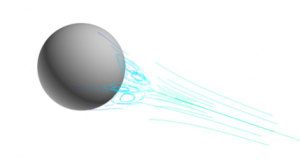 Some preliminary results involve flow past a solid sphere, shown in Figure (1), and Figure (2) demonstrates that the added modules can simulate flow in highly complex geometry. In this case, the flow past a cluster of randomly distributed cylinders, which is a configuration often used to study the permeability of porous media. The velocity vectors shown in Figure (2) indicate that the gas finds its optimal path through the porous media depending on the width of the gap between each cylinder. The extension of Code_Saturne to handle the R26 equations was very challenging to implement but we now have a significant capability for modelling rarefied gases. Preliminary tests with the code have been very successful and we are continuing to test its new capabilities. We are also in discussion with EDF to include the new modules as part of a future release of the code.